Ever since we heard about the Xbox One's HDMI input feature—which is intended to route HDMI devices like a cable box through it and "snap" to that program—I've been excited to put it to the test. Could we play another Xbox One through an Xbox One? 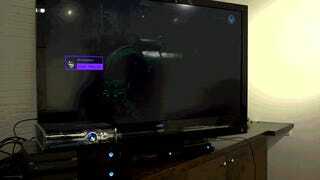 What about an Xbox 360 hooked into an Xbox One which is itself hooked up to a second Xbox One? Xbox Inception? Now if that's all too insane for you. Hell, if that's a tad confusing, here's a simpler chain. This is what you get when you hook up a Wii U to an Xbox One. You can play one through the other! Now, you wouldn't want to play Saint's Row IV through three consoles. Trust us. There's lag. We're also not sure it all looks quite as nice. But for now we're just having fun. And, remember, Microsoft doesn't officially push the Xbox One as a machine that should be used for chaining game consoles. Consider this just a parlor trick. One final note: Because of the PS4's HDCP encryption, you actually can't play Killzone on Xbox One (for now).